A reproducible and efficient transformation method was developed for the banana cv. Rasthali (AAB) via Agrobacterium-mediated genetic transformation of suckers. Three-month-old banana suckers were used as explant and three Agrobacterium tumefaciens strains (EHA105, EHA101, and LBA4404) harboring the binary vector pCAMBIA1301 were used in the co-cultivation. The banana suckers were sonicated and vacuum infiltered with each of the three A. tumefaciens strains and co-cultivated in the medium containing different concentrations of acetosyringone for 3 days. The transformed shoots were selected in 30 mg/l hygromycin-containing selection medium and rooted in rooting medium containing 1 mg/l IBA and 30 mg/l hygromycin. The presence and integration of the hpt II and gus genes into the banana genome were confirmed by GUS histochemical assay, polymerase chain reaction, and southern hybridization. Among the different combinations tested, high transformation efficiency (39.4 ± 0.5% GUS positive shoots) was obtained when suckers were sonicated and vacuum infiltered for 6 min with A. tumefaciens EHA105 in presence of 50 μM acetosyringone followed by co-cultivation in 50 μM acetosyringone-containing medium for 3 days. These results suggest that an efficient Agrobacterium-mediated transformation protocol for stable integration of foreign genes into banana has been developed and that this transformation system could be useful for future studies on transferring economically important genes into banana. 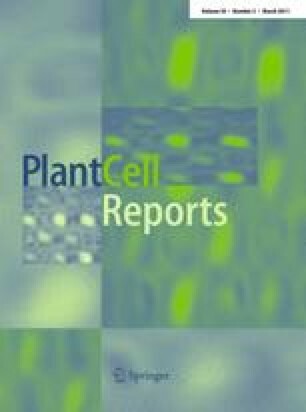 A contribution to the Special Issue: Plant Biotechnology in Support of the Millennium Development Goals.